The purple loosestrife and the goldenrod are blooming (*), and the sumac is on fire (**). Life is good. I’m researching axes. I am sorely lacking in axe skills, which I think are the perfect skills to have: good for fitness through meaningful physical work, good for the mind as an exercise in mindfulness and purpose, and a skill to have down before the time it becomes necessary – a hard winter, a lot of trees down, TEOTWAWKI. At first I thought I wanted an all-purpose Hudson Bay Axe, recommended by Alex Leavens, whose axe skills video I’ve been studying. Though I’d still like one of those, I am now thinking I’d like to learn to handle a splitting axe first: an axe with which to split, not chop wood, but not a maul, which is too heavy for me. I’m thinking a nice long handle and a head that’s 4 lbs. max. I’ve been eyeing the Granfors large splitting axe, or maybe it’ll be the small one… We’ll see. I like to take my time choosing. We’ve also begun talking about goats. Amie is of course all for it. She has already drawn the layout for the shelter and “play pen”. DH is cautiously interested, not so much for the milk or meat, I think, but for the shrub-eating capabilities (we spent two days battling the blackberries up front). I’m the one who will be doing all the research. I’m giving away three of the five kombucha mothers I made two weeks ago. Due to the high temperatures the teas basically jumped from tea straight to vinegar. It’s not a loss: the vinegar goes into the chicken’s water and into a jar for when I need it, and the mother pieces made vigorous “babies” for giving away. One mother I had to throw since it had mold in it. The fifth one I’m keeping to try another brew. (*) The bees’ favorite nectar plants. They’re bringing in lots of honey now. 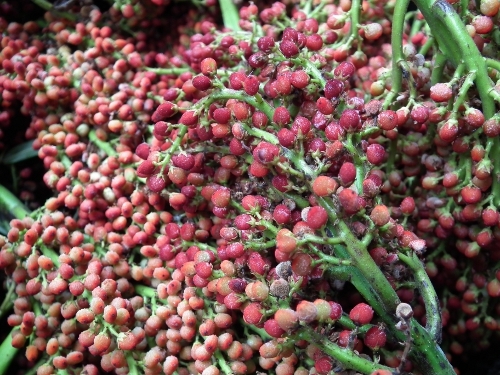 (**) I woke up in the middle of the night to the sound of rain and knew I’d not be harvesting staghorn sumac berries for sumacade. Berries for eating or steeping should be harvested after a long dry spell; rain washes away the taste. That didn’t, however, stop me from driving to the landfill and harvesting 5 gallons of spikes (or panicles) for smoker fuel. Dried sumac berries are good fuel, burning long and smoking cold. The area where the bushes grow is a busy road where trucks pass, so I wouldn’t harvest there for sumacade, spice (zatar) or medicinal purposes (it’s a powerful antioxidant). I do know a patch of sumac that is away from traffic and herb/pesticides. I’ll harvest those when it’s dry again. Handling these makes your hands slippery smooth and the sour-sweet smell is divine. On the other hand, any small cut will start smarting from the acid. You also need to resign yourself to getting lots of bugs, some biting, some not, on you as you wade through the bushes or cut up the panicles. 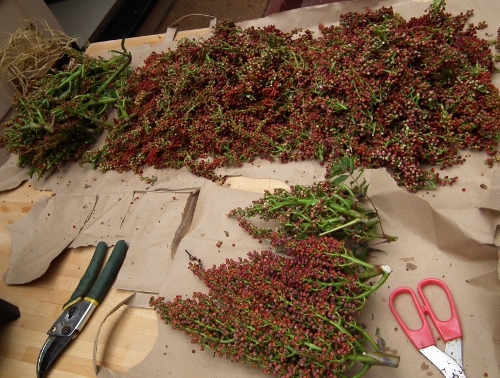 I cut away as much of the stems as possible, then spread the berries (with smaller stems) on screens that I put in our attic, which is warmer and drier than anywhere else in the house. When it gets really hot up there the fan comes on, making it a perfect drying area.